Note: This book will be published in French by Diateino in January 2011. 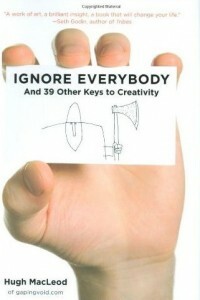 As a reminder, Diateino is also the French publisher of Seth Godin’s and Guy Kawasaki’s most recent books. To read my French version of this preface, please go to the Diateino blog. I’m a cartoonist – This is how Hugh MacLeod introduces himself on his blog, www.gapingvoid.com. In France, the word “cartoonist” generally refers to the creators of American animated cartoons. In English, the term applies to any person who draws cartoons in a variety of formats — such as editorial cartoons, comic strips, comic books, or animation. The word comes from the Italian “cartone” that started to designate preliminary drawings and sketches for paintings, stained glass windows, and tapestries early in the sixteenth century. Even though the Webster reports that the first known use of “cartoon” in English dates back to 1671, Punch Magazine is the publication that gave the word its modern meaning in 1843 by labeling one of its illustrations, “Cartoon, No.1: Substance and Shadow,” a satirical drawing where caricaturist John Leech (1817-1864) was deriding the preliminary drawings of the paintings that were to decorate the Houses of Parliament under reconstruction because of the 1834 fire. From then on, “cartoons” started to brand humorous drawings that often had social and political undertones. During the same period, France also has its “cartoonists”, of course, such as J.J. Grandville, Honoré Daumier, or Charles Philipon; however the French press never went into a similar intensive marketing of cartoons as its Anglo-Saxon counterpart did. As indicated by Jean-Paul Gabilliet, one of the rare French specialists of American cartoons, “the democratic mythologizing of press illustrations in France only happened in the nineteenth century and faded after WWI, with images being treated as a mere additive to writings.” Nonetheless, Gabilliet does not fail to mention contemporary notable exceptions, such as Cabu or Pétillon. For MacLeod, success didn’t come overnight. He crafted it. It’s a success earned through work, patience, and his ability to leverage the platform of expression that the Web offers. MacLeod could have waited to be recognized through traditional means. Instead, he chose to create his luck. His free spirit made him choose self-publication in his own “magazine,” his blog. Hugh Macleod is a cartoonist, yes, but on his own terms, and on a ubiquitous tribune. … Or follow a great tradition by making it yours and enriching it with your own idioms, as is the case for MacLeod. He calls himself a Texan, but his father is Scottish, and he has spent part of his life in Great Britain. As a matter of fact, there is something quite European about his style. At times, you will think of Paul Klee’s pencil strokes, of entanglements in the style of Hundertwasser, of postures à la Ronald Searle, or of proliferations like Sempé (for whom “nothing is simple” and “everything gets complicated”). At times, the metal-wire-like lines surmounted with a black ball, a while circle, or a spiral may remind you of the tension, attraction and repulsion effects of some of Alexander Calder’s mobiles. In all cases, though, you will still discover a very personal style and, on the minuscule area of a business card, the large space of the experiences and fancies of an artist, expressed with the insolence and the cynical benevolence of the best cartoonists in history. I’ve known Hugh for 22 years and this captures him perfectly.